I’ve taken on the simple philosophy my father taught me: “it is only a thing”. If it is lost, stolen or ruined it can be replaced. What is important are the relationships we have with family and friends. These relationships must be watched over and cared for since they are what is truly valuable in the world. With that in mind and since I’m locking my dad and I in a truck for 14 days it might as well be the best truck I have access to at this time. Of course I’ll heavily insure it, adding on AAA, towing, road side assistance, and any other road hazard help I can take on. All in the name of it’s only a thing, and its the only thing that will get us back from Deadhorse once we start down Haul Road. Currently the rig is stock. However with the help of some sponsors it looks like we’ll be getting a few mods soon. 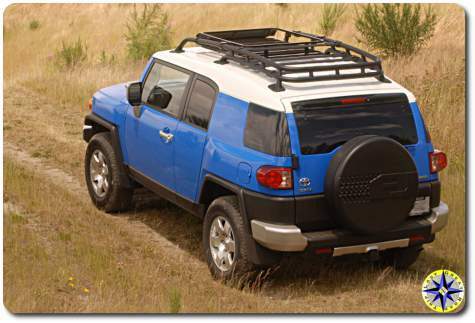 Everyone interested in the before rig you can look at the 2007 FJ Cruiser product reference guide just be warned it is a big file and not for faint of bandwidth. Oh. My. Heck. This is the coolest thing EVER. I won’t make any of the typical comments you would expect from me, for now, because seriously, my jaw was hanging the whole time I read through your site. I have linked you to my blog and will give you a little plug, just for fun, but again, Oh my heck how FUN!